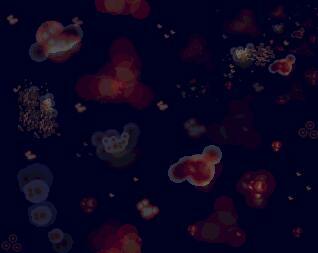 In animation, these 'bubbles' bounce around convincingly - 'squashing' into each other and finally coming to rest. Click here for the full animation! 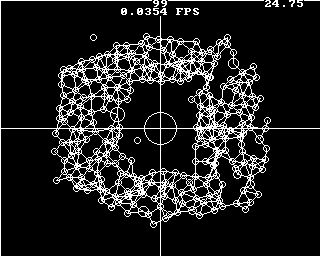 (AVI format - 2.2 Meg zip download) So much better when it's moving, but basically, 'atoms' from the right are propelled into the circular loop and just keep on coming until the whole contraption gets jammed. The inside loop section actually expands and retracts. ...The colorful world built entirely using mathematical atoms and molecules. Pictures and animations demonstrate structures colliding and interacting. The best way of describing what SuperMagnet does is to say that it manipulates an array of 'atoms' and uses 'mathematical chemistry' to create all sorts of cool effects. For example you could have a lovely stretchy bridge made up of, say, 20 atoms, with a giant ball of mini-magnets or one big magnet jumping on it. Or you could simulate a pipe system with water molecules (hundreds of tiny magnets) running through it, all while being affected by gravity! Imagine running your own small scale solar system with the planets orbiting the sun - or send a comet to head straight for Earth! Even a snooker table with real-world physics and friction. The possibilities really are endless. You are, in effect, creating a world of atoms - all with their own individual properties. This is the moment in time just before the 'comet' reaches its destination - Earth. 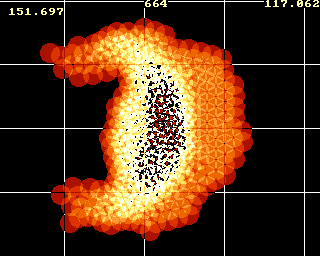 In this example, the comet only consists of ~100 'molecules', but my program offers unlimited amounts. 5...4...3...2...1...>>> ...0 !! and meltdown. The comet collides with the Earth causing complete breakdown of nuclear chemistry. 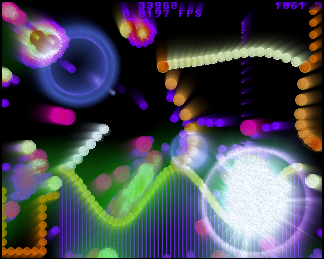 Much better in action of course than these static screenshots could ever convey. 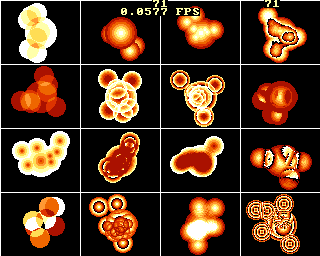 All the animations on this page are saved in a special kind of lossless AVI format compression. They should work on all major AVI players including Windows Media Player. 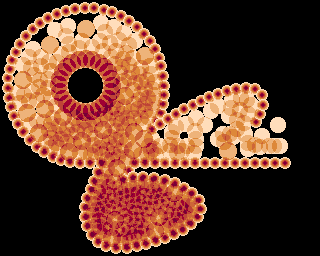 One of my most ambitious experiments is also my largest - a whacking 40 megabyte animation consisting of over 2400 particles. (see boxed out blue area in diagram) The mincer on the left minces and is never-endingly filled with more 'mince'. 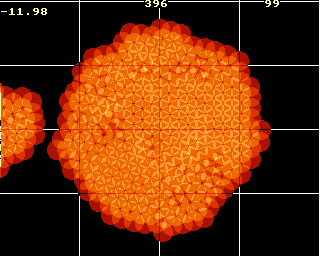 The section at the top right is an interesting mathematical 'black hole' kinda thing with its own weird gravity. 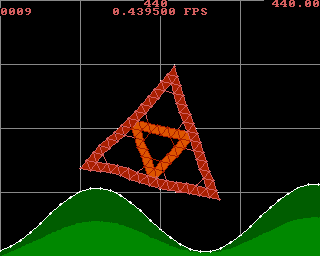 Once again, you have to see it in motion at a smooth 50 frames per second to marvel at it. Scroll the slider horizontally to the right for a more detailed look and 7 further frames! Download the Super Galactic Mega Mincer! Underneath the apparent complexity - lie simple rules that most moving magnets follow. This is the core of the program - and it determines what's going to happen to the magnets and how they interact. Are they going to 'repel' at supersonic speed, 'attract', or drift around each other? Everything can be configured easily so that certain magnets can be given different properties to other magnets. Gravity can also easily be added. Magnets with this characteristic will want to run away from each other. They will do this indefinitely - unless another force (either from the same magnets or from other magnets' forces) prevents them from doing so. 1: Each magnet is repelled at a speed inversely proportional to the distance of the others. By multiplying the distance that the two interacting magnets are from each other, we can also get the magnets to slow down their forces gradually as they get further and further apart. This would also mean that the closer they are, the more resistant they are to becoming closer still. 2: Each magnet is repelled at a speed proportional to the distance of the others. Alternatively, we can reverse the previous notion so that when they get further and further, the force becomes greater and greater so that the further they get from each other, the faster they'll go. This would also mean that the closer they are, the less resistant they are to becoming closer still. Magnets with this characteristic will want to plummet towards each other. They will do this indefinitely (and be ultimately on top of each other) - unless another force (either from the same magnets or from other magnets' forces) prevents them from doing so. 3: Each magnet is attracted at a speed proportional to the distance of the others. Once again, by multiplying the distance that the two interacting magnets are from each other, we can also get the magnets to slow down their forces gradually as they get closer to each other. This would also mean that the further they are from each other, the more crazy they are at becoming closer. 4: Each magnet is attracted at a speed inversely proportional to the distance of the others. So how do we get the magnets to form a stable equilibrium - so that they always try to remain at a certain distance from each other? Initially, one might think we just need to use a dual combination of the attract and repel attributes, but these would only cancel each other out - and there would be no effect. The solution is in the "power of" symbol. We do actually have both the attract and repel modes, but we also perform some further maths on the repel mode using the power function - and this will keep the magnets generally at a constant distance from each other - rather than flying off to the other side of the galaxy, or imploding upon each other. Lots of cool and different effects are possible according to the exact value of this numerator. Water Chemistry :- One of the first ever modules I created with SuperMagnet. Every water molecule whirls round the gravity ball in the middle - which attracts and repels them to form a stable 'ring' equilibrium once they run out of kinetic energy. 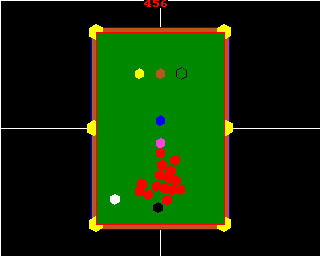 A snooker table with a high power value given to the repel force to provide realistic ball collisions. Here you can see the white ball has just been hit into the pack of reds. SuperMagnet allows you to zoom in and out, change the time (speed and direction - yes - reverse time!) and much more... - all while the animation is running! Even games can be created! The idea here is to pick up the atoms at the bottom left (one at a time) - and carry them over to the top right corner. Easier said than done when gravity is against you! 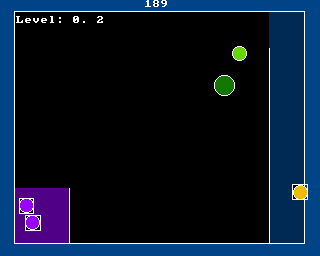 8 levels deep and the gravity becomes very strong - requiring precision movement to complete the task. A more fun and elaborate version of the original! 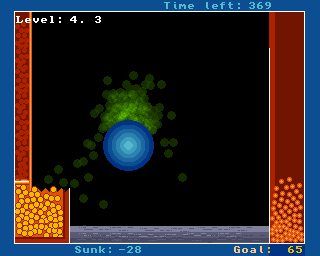 You have 40 seconds to grab as many of the balls located at the bottom left - and shove them into the far right section. Careful though, don't go too fast.... - any that are dropped to the grey floor during transport, are taken away from your total score at the end. Good tactics include steadying them up - somewhat akin to herding sheep - but much more fun! How many can you get? Yes, this looks like a mess here, but just wait until you see it in action! 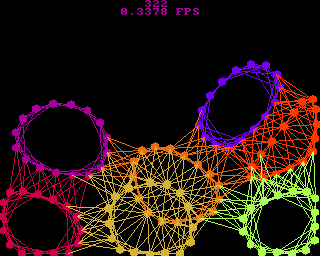 Like the Mincer anim, this animation could go on much longer (CPU speed permitting). That's more or less it! =) I hope you've enjoyed reading this page. Don't forget to download the animations - they look a lot more impressive than static screenshots. In the future, I plan to upload further animations, so make sure to return! If you'd like to see more animations from SuperMagnet, maybe email me or visit Skytopia's Whirlpool of Knowledge Forum. Incidentally, they were also put on an old issue of the Amiga Format CD too, so if you have an Amiga, you can view the original ANIM5 animations. What I'd really love though is a GUI made out of this program and its concepts. There's nothing really like it out there. Elastolab, Falling Sand Game and Sodaplay, although good in their own way, don't really come close to offering the potential of something this universal. A fully interactive interface and a realtime 'magnet' engine would be tremendously fun to use, and the creative possibilities for learning and experimentation are endless. If someone is interested in converting the idea to an Amiga or PC program, I would help of course with the structure and design of the program, but it would save me a lot of hard work and effort if I had someone to help with the actual programming side. If you're interested, please contact me and I'll be happy to hear from you! Such a program could become very popular and would be a joy to use for everyone. Have you any comments about this page? Visit Skytopia's Whirlpool of Knowledge Forum. 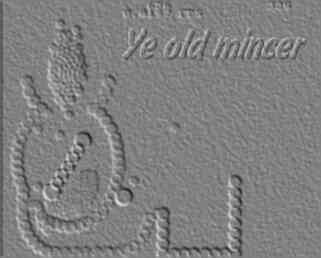 All graphics, animations and text on this page are copyright 2002 onwards D. White. If you wish to use any of them, please contact me for permission.